The watch itself sports a single button that you do everything with. Little icons such as + and – and OK? prompts are displayed to show what function it is performing when adjusting settings. The watch has a single heart rate zone – so you can set a lower and upper boundary for the range. Outside these ranges the watch can be configured to beep at you – I found this annoying and turned it off. The little heart logo at the bottom gives you a visual indicator if you are below, within or above your designated range. Starting a workout is easy – put on the strap (apply a little moisturiser/sun cream to help the electrical contact – but not vaseline or oils! ), then press the button – the watch displays EXE and starts the clock. During the workout the watch can display your current heart rate, the current time, the and the duration of the workout. These are simply cycled through by holding the watch near to the centre of the strap – easy to do while running – it will beep to confirm the change of display. If you put it in ‘light up mode’ by holding the button before starting your work out the display will illuminate the backlight when you hold it up to change the display mode. This is useful when running in the dark winter months! When you’re done you simply hit the single button again and the results are saved to the single entry memory. A single entry is a bit stingy – two would have been nice so you can quickly compare without referring to your training log – but it is enough for you to get back home and put the information in your training log yourself. All in all a good basic functional heart rate watch. Not the cheapest entry level unit – but it has worked consistently for me for well over a year now. 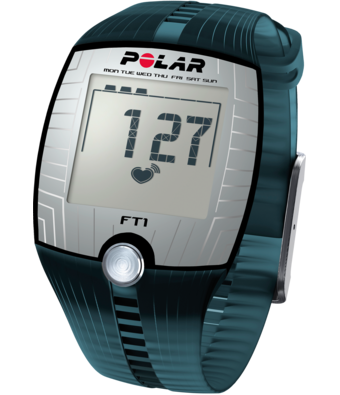 This entry was posted in Gadgets, Reviews and tagged cycling, ft1, gadget, heart rate, polar, review, running, watch. Bookmark the permalink. Hi- I have an FT1 and it needs the battery replaced. I’ve emailed Polar but I haven’t heard back yet on a price. There are only 2 Polar service centers in the continental US, so I’m thinking about cracking open the case. There are 4 torx type screws on the back- do you know if a T6 will fit? I’ll need to buy a bit– thanks! Sorry, I have not had this monitor in a long time. You’re probably best buying a cheap set. Always useful to have around! Ok, thanks! I went ahead and got a set of torx drivers and replaced the battery. The watch is running now. I just need to try it out with the chest strap. Time to go running!